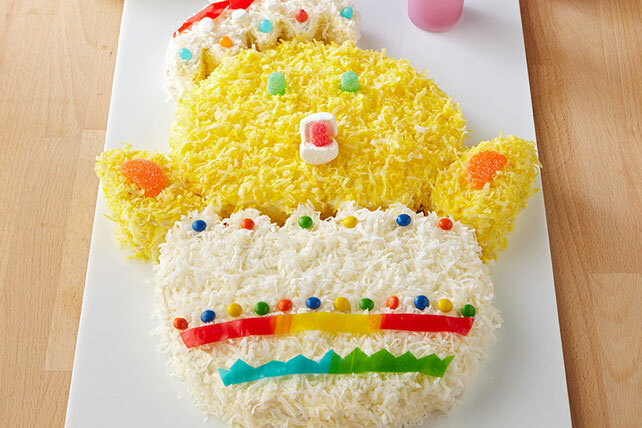 Hatch a new Easter tradition with this adorable Baby Chick Cake recipe. Our easy-to-follow instructions make creating our tasty Baby Chick Cake simple. Set this out this Easter and watch it become the newest family favorite! Prepare cake batter as directed on package; blend in dry pudding mix. Bake as directed on package for 2 (9-inch) round layers. Cool cakes in pans 10 min. ; invert onto wire racks. Remove pans; cool cakes completely. Cut cake layers as shown in Diagram 1. Arrange on tray or large platter as shown in Diagram 2. Beat cream cheese, butter and vanilla in large bowl with mixer until well blended. Gradually beat in sugar until well blended; frost cake. Mix food coloring and water; toss with half the coconut until evenly tinted. Sprinkle over chick. Sprinkle remaining untinted coconut over egg. Add decorations to resemble photo. Have fun with your family decorating this special-occasion dessert. To add a beak for the chick, cut out triangle from 1 side of additional JET-PUFFED Marshmallow. Dip cut-edge in colored sugar, if desired. Add to cake.